James Edward Rice was born on Sunday, March 8, 1953, in Anderson, South Carolina, to Roger and Julia Rice. Residents of the town say that even as a lanky teenager, "Ed," as he was – and remains – known to his friends, showed promise. He led his 1969 American Legion team to the state finals. However, it was still a time of segregation in the South, and Rice, despite his promise, had to attend Westside High School, as opposed to the all-white T.L Hanna High. Sometime before Rice's senior year, when integration was mandated, Anderson's district board drew lines to decide who would attend what school. The resulting line was drawn so that the Rice household was included in the Hanna district. His engaging personality and gentle charm won over most of Hanna, he was elected co-class president, and helped ease the racial tension that accompanied integration. The highly prized prospect joined the parent Red Sox for 24 games late in 1974, debuting on August 19. He hit his first major-league homer on October 1, off Cleveland's Steve Kline. Rice batted .269 in 67 at-bats. Whatever arrested his rise to the majors, and however unsettled he may have felt, when Conigliaro’s season fizzled a few weeks in, Rice had the job to himself. By July he took over left field and held it the rest of the season. He hit .309 with 22 home runs and 102 RBIs, ending up second to Lynn for the Rookie of the Year award. The two rookies Rice and Lynn were dubbed the "Gold Dust Twins" and formed what may have been the most productive rookie tandem of all time. Hank Aaron was most impressed with the potential of the young slugger, and even speculated that Rice would go on to break his home-run record.3 But Rice's season came to a premature end on September 21, in a 6-5 win over Detroit, when Tigers pitcher Vern Ruhle broke his left hand with a pitch, sidelining him for the rest of the season and forcing him to watch the Red Sox lose a grueling, seven-game World Series to Cincinnati from the bench. Recovering from his injury, Rice regressed a bit in 1976, hitting .282 with 25 home runs. In 1977 he became a full-fledged star, leading the league in total bases (382), home runs (39), and slugging percentage (.593). On August 13, 1978, he became the first Red Sox player since Ted Williams in 1939-40 to total 20 homers, 20 doubles, and 10 triples in consecutive seasons. On August 29, 1977, in an 8-7 loss to Oakland, he had his first three-homer game (his second – and last came exactly six years later, on August 29, 1983). 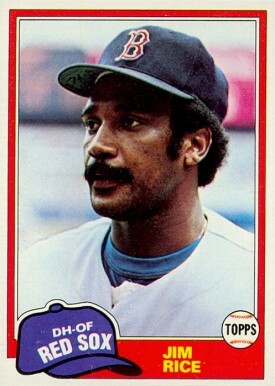 Jim Rice played his entire professional career with the Red Sox, but none of his seasons equaled the magic of 1978. He started the season off on the right foot, hitting a game-winning single in the 10th inning of the April 14 home opener, and continued his torrid pace into October, when the Red Sox lost to the New York Yankees in a devastating one-game playoff. It was a shame that one of the finest seasons in Red Sox history was overshadowed by the feeble swing of a weedy infielder. but Rice's accomplishments were rewarded.4 He was voted the MVP award he so richly deserved, leading the majors in slugging percentage (.600), games (163), at-bats (677), hits (213), total bases (406), triples (15), home runs (46, the most for a Red Sox player since Jimmie Foxx hit 50 in 1938), and RBIs (139). He was the first American Leaguer to accumulate 400 total bases in a season since Joe DiMaggio in 1937. In 1979 Rice had another big year, becoming the first player to have 35 homers (he had 39) and 200 hits (he had 201) for three consecutive seasons. Fans elected him, along with teammates Carl Yastrzemski and Fred Lynn, to start the All-Star Game.5 It was an all-Red Sox outfield. Rice in particular was recognized as perhaps the best hitter in the game. Rice had another hand injury in 1980, and suffered subpar seasons in 1981 and 1982 at least partially as a result. Nevertheless, in 1982, Rice had a day at Fenway Park worth remembering. He had a difficult relationship with the press, who presented him as a surly, unfriendly player. Jonathan Keane, from Greenland, New Hampshire, was a 4-year old boy in 1982, and he would probably disagree with this assessment. On August 7 Jonathan was attending one of his first Fenway games, sitting along the first-base line in the field boxes, and watched as his favorite player, Red Sox infielder Dave Stapleton, stepped into the batter's box against Richard Dotson of the Chicago White Sox. Stapleton fouled a pitch sharply to the right, and the hard-hit ball cracked Jonathan in the head, cutting open his left temple and fracturing his skull. In a 1997 article, Arthur Pappas, the Red Sox team doctor in 1982, claimed he had never seen so much blood at Fenway. Rick Miller, who was near the on-deck circle, cried for Red Sox trainer Charlie Moss, but instead Jim Rice, who didn't see anyone moving, instinctively leaped into the stands and picked up the unconscious toddler. Cradling Jonathan, Rice ran into the clubhouse, where he brought him to Arthur Pappas in the trainer's room. In a 1997 article describing the incident, Pappas was quoted as saying, “Time is very much a factor once you have that kind of a head injury and the subsequent swelling of the brain. That's why it's so important to get him to care so it can be dealt with. [Rice] certainly helped him very considerably. ''6 The supposedly unfriendly outfielder did something that many other Hall of Famers surely haven’t. He saved a young boy's life. Rice had typically fine years in 1984 (28 HR, 122 RBIs, .280) and 1985 (27, 103, .291), garnering All-Star honors each year. In 1986 the Red Sox returned to the postseason, and Rice was their primary weapon in the middle of the lineup. He hit .324, with 20 home runs and 110 RBIs, his last big season. After missing the postseason in 1975, Rice was healthy this time. He hit just .161 with two home runs in the Red Sox League Championship Series victory over the California Angels, but one of the homers was a key three-run wallop in Game Seven. He hit .333 in the World Series loss to the New York Mets, in what was to be his only fall classic. Bothered by an injured elbow, Rice fell off in 1987 (13 home runs, 62 RBIs, .277), and he had to have offseason knee surgery. These injuries and eyesight problems plagued Rice for the next two seasons, and hastened the rather sudden end to his career after the 1989 season. The last few unhappy at-bats of the season’s difficult twilight dropped Rice’s career average from .300 to .298, a drop that provide ammunition for critics in the Hall of Fame-eligibility years that followed. Rice spent all 16 years of his big-league career with the Red Sox, playing his final game on August 3, 1989. He returned to serve the organization when he was appointed hitting coach in 1995, and young hitters from Nomar Garciaparra to Trot Nixon to Mo Vaughn benefited from his tutelage. Rice continued as Red Sox hitting coach until 2000. Ironically, Rice joined the ranks of the Boston sports media as a baseball analyst for the New England Sports Network (NESN), and became a colleague of some of those he used to war with. Honors followed the slugger out of baseball. On November 1, 1995, he was inducted into the Red Sox Hall of Fame in its inaugural class. His plaque can be viewed in the Red Sox Hall of Fame at Fenway Park. The Red Sox also put on display a row of silver bats, replicas of all the Silver Slugger awards won by Red Sox players. Two of those belong to Jim Rice. In 1999 Sports Illustrated rated him South Carolina's ninth best athlete of the 20th century. On February 18, 2001, Rice was inducted into the Ted Williams Hitters Hall of Fame. A community center in his hometown of Anderson is named in his honor, the Jim Ed Rice Center. An updated version of this biography appeared in "The 1986 Boston Red Sox: There Was More Than Game Six" (SABR, 2016), edited by Bill Nowlin and Leslie Heaphy. It was originally published in "'75: The Red Sox Team That Saved Baseball" (Rounder Books, 2005), edited by Bill Nowlin and Cecilia Tan. 3 Jeff Goldberg, "The Day Rice Made Contact: One of His Memorable Moves Was to Aid an Injured Young Fan, Hartford Courant, August 7, 1997. 4 The infielder was, of course, Bucky Dent. 5 Yastrzemski was injured, however, and unable to make a start in the outfield; he was moved to first base instead, replacing also-injured Rod Carew. He was replaced in the outfield by Don Baylor. 7 Paul White, "My 2002 Hall of Fame Ballot: Slot #4, Jim Rice," posted on Baseballlibrary.com on December 11, 2001. 8 White quotes Stark as saying, "He was a one-dimensional player whose career thundered to a halt just as he was on the verge of cementing his sure place in the Hall (only 31 homers, 162 RBIs after age 34). And you essentially have to vote on him as a hitter only, because he DH-ed extensively. He gave you no speed, no Gold Gloves, no off-field 'character-and-integrity' points." This is from Stark's (reposted) November 19, 2003 ESPN.com article "Stark: My Hall of Fame Ballot." 9 Peter Gammons, Beyond the Sixth Game (Boston: Houghton Mifflin, 1985). 10 Andrew Neff, "Rice Enjoys TV Analyst Stint," Bangor Daily News, April 1, 2005. 11 Adam Kilgore, "Rice Elected to Hall of Fame," New York Times, January 12, 2009.